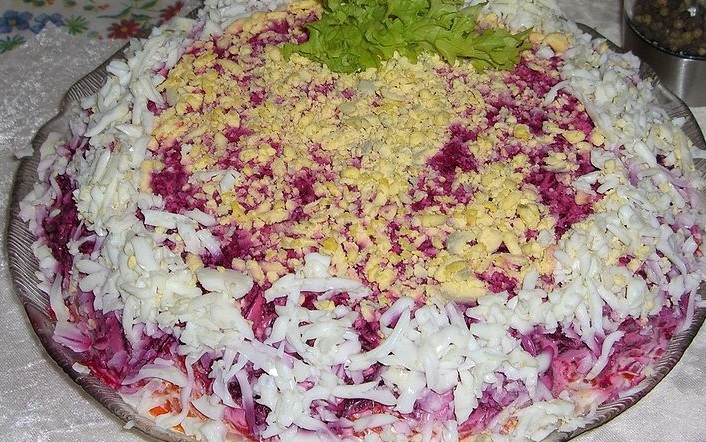 There are several salads which constitute a “must” for any Russian table. This article will begin with some of the best loved salads for almost any family, including the Russian traditional favourites such as the Salad Olivie, Carrot Salad, Crab with Corn salad, and Beet Vinaigrette. One of the first things you’ll notice about most Russian salads is the absence of lettuce. Due to the length of the growing season lettuce doesn’t fare as well as root vegetables. Some families are successful in growing it in a greenhouse setting, perhaps at a country dacha, but most Russians dwell in massive high rise apartments, and so the most common garden space is found out in the country at a weekend dacha (cabin/country house). The next thing you’ll notice about Russian salads is the prominence of “root crops,” those vegetables which grown underground. These plants have the advantage of the ground as a natural shelter from weather up top on the surface. That means they can be started earlier, or can finish later than ordinary plants. 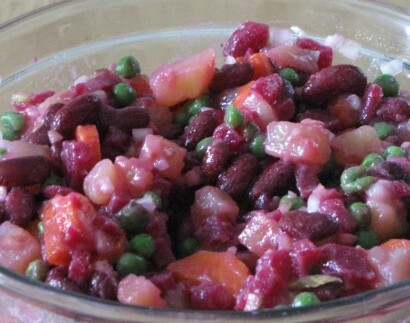 Therefore, you’ll see lots of things like potatoes, beets, carrots, radishes, onions, turnips, etc, in a Russian salad. Finally, Russian salads are much more like their Greek counterparts than most realize. Russians love to “mix it up” a bit by adding fruits like grapes, melon, raisins, pineapple, apple, etc, to a vegetable salad. Often honey or molasses is added to a salad, creating a very nice surprise for the palate. 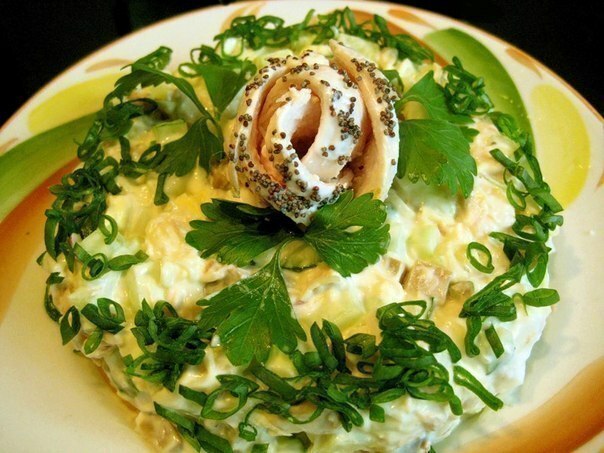 With all the attention and care given to making a Russian salad, and most are very simple and quick to put together, you will soon understand why salads are such an important part of every Russian meal. 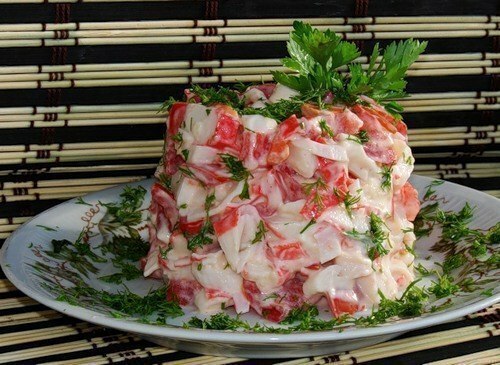 There are a number of excellent dishes which could qualify for the starting position, so without purposely slighting any of the others, we shall begin with the very popular Салат оливье (Salad Olivier). 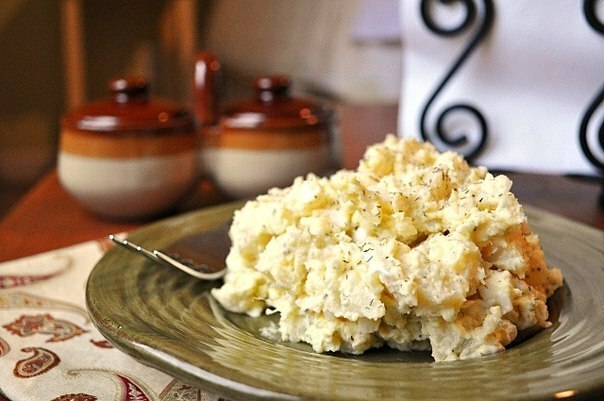 This popular version of potato salad is Russian, although some claim it to be French or Persian. So, lets quickly cover the official story of how this popular dish was created: in 1860, a Belgian chef who owned and operated a highly regarded Moscow restaurant, The Hermitage (means “place for hermits”), created this dish. His name was Lucien Olivier, and thus the name of this wonderful dish. The magic stops there however, as he took the exact recipe to his grave, which is here in the Vvedenskoye Cemetery (German/Protestant cemetery) in Moscow. Olivier never used traditional mayonnaise in his recipe, although he did used Olive oil mixed with a French wine vinegar, along with other ingredients. Sometimes it is thought that the olive oil had something to do with the name of the salad. Not really, but his original recipe did include veal, caviar, grouse, lettuce and other ingredients not available to the working class. Over time, his famous salad was adapted to ingredients which could be obtained by ordinary folk. Thus, perhaps the name really has little to do with the “Olivier salad” most of us enjoy today. Sometimes you’ll hear Russian-speakers call it салат столичный, meaning “capital city salad.” Given the evolution of this salad over the years, perhaps that is a more accurate title today. It is a “must have” dish on the New Year table. You can make this authentic Russian potato salad “Olivie” in your own kitchen, and it is delicious! The particular recipe is compliments of a very excellent Russian cafe in Boston, Cafe “Stoli” (столы means “tables”). If you love shrimp or chicken, you’re going to dig this dish! And it’s so easy that if you can buy some pickles, a can of peas, boil 6 eggs, peel a few potatoes and cut up some carrots…..your friends will think you’ve become a master chef! The salad is just as delicious in a vegetarian version, sans the meat. 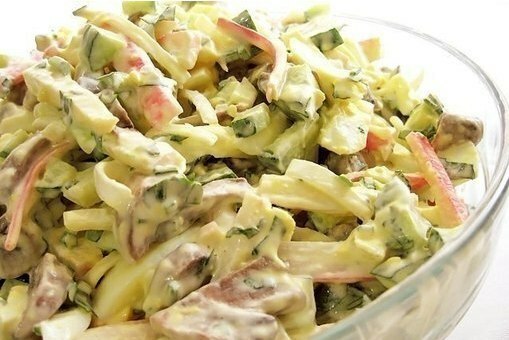 Dress with mayonnaise or sour cream. and of course mayonnaise is added almost after each layer. 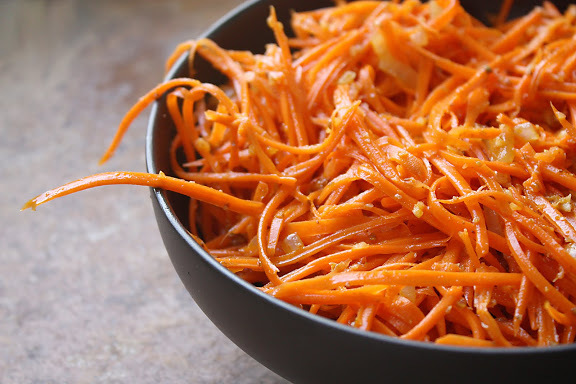 Check out the Russian carrot salad at SheSimmers.com for another excellent variation. 1. Boil the rice, so it remains “friable”, not sticky. Do not overcook! Don’t forget to add salt when water starts boiling. 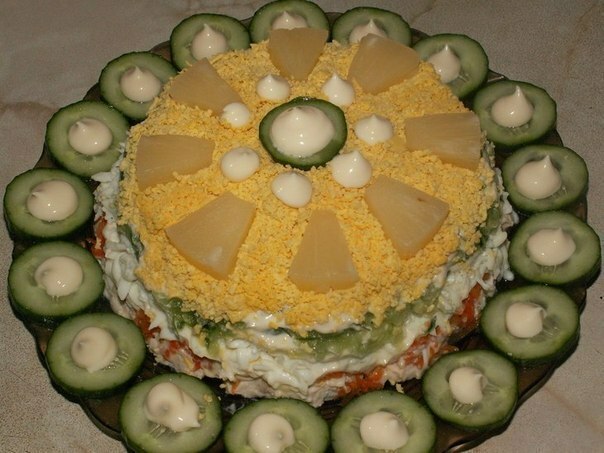 This is often named as Russia’s second most popular salad. This recipe is from Natasha’s Kitchen and we encourage you to visit Natasha’s excellent blogsite to learn more about her approach to Russian and Ukrainian cooking. In a medium pot, boil beets until they can easily be pierced with a knife, or use canned beets which don’t require any cooking. In a separate pot, boil potatoes and carrots about 30 minutes or until a knife goes smoothly through the potatoes. Peel the skins from the potatoes, beets and carrots, then dice pickles, beets, potatoes, carrots & finely dice onion. Note: If served during the annual Nativity or the Easter fasts, the egg is optional. For Diabetics, the egg helps replace protein from the lack of meat during a fast but first speak to your priest about which practice is best for your situation. 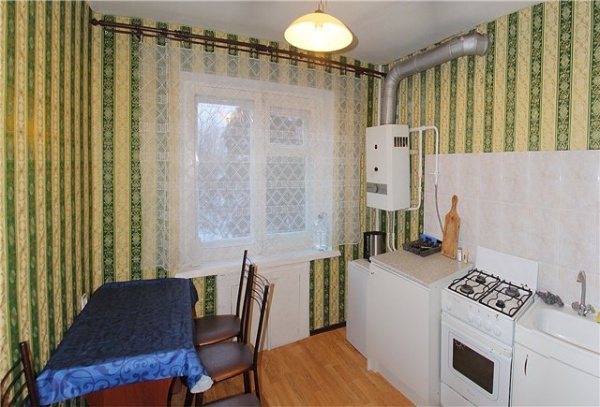 Hot water is provided by an electric pass-thru heater mounted on the wall near the window. – Boil eggs, cool, separate the protein from the yolk, cut into a protein. The yolk can be left for decoration. – Cook shrimp in lightly salted water. – Then mix into boiling water, pre-cut into rings & calamari. Don’t overcook! – Cut the crab sticks. 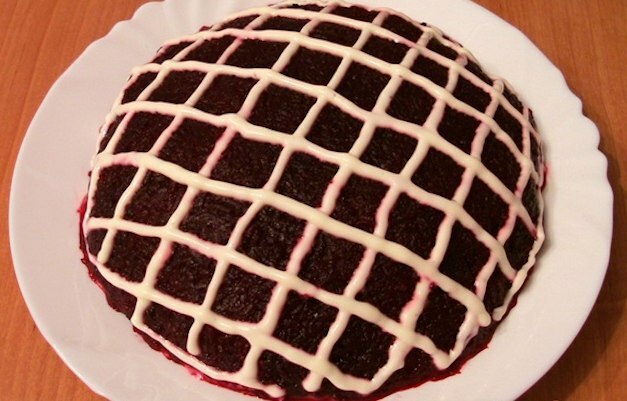 – Add a couple tablespoons of mayonnaise, stir, and then add red caviar. – Salt, pepper to taste, but I advise salt on top after everything is mixed because eggs and mayonnaise can provide enough salt. Not just any salad makes it to the exclusive Mendeleyev Journal Salad pages but the MJ test kitchen has declared that this Russian “Red Sea Salad” is well deserving so you can find it here along with our other delicious Russian and Ukrainian salads. Cut crab sticks diagonally into strips, cut tomatoes in julienne style, too. If tomatoes are too watery, drain and remove the seeds. Squeeze in some garlic. Mix with mayonnaise. 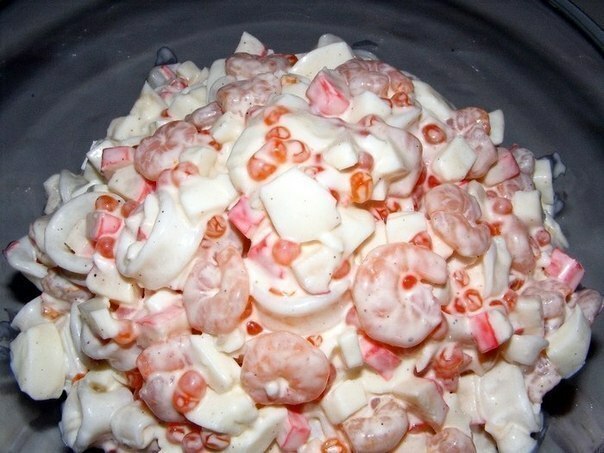 “Салат Нежное облако” (Soft cloud salad). Locals call it “Soft Cloud Salad” and if you try this recipe you’ll learn why. Pineapple (canned, rings) – 2 to 3 pieces. Boil chicken breast and then chop it finely while adding salt and mayonnaise, mix well. Place the chicken-mayonnaise mixture into a large dish. Boil eggs, cool, separate the whites from the yolks. Boil carrots gently after grating into small pieces. Slice cucumbers and let stand on towel to drain excess liquid. Using the chicken as a base, lay carrots (with a little salt), pour the mayonnaise, then grated egg yolks with mayonnaise, then layer cucumber and egg whites mixed with mayonnaise, and finally finish with a layer of cucumber and egg yolks mixed in mayonnaise at the top. Garnish with pieces of pineapple and dollops of mayonnaise. Грудка куриная (филе) – 300 г.
Огурец (средний, свежий) – 2 шт. На курицу выложить морковь (немного посолить), полить майонезом, далее – белки (немного посолить), майонез, огурец, майонез, сверху выложить слой из желтков и произвольно в качестве украшения выложить ананасы. Mix with mayonnaise, salt, and garnish with parsley. Грибы поджарить с луком. Огурцы порезать кубиками. Крабовые палочки – соломкой, яйца – кубиками. Our next salad entry is “Salad Cheburashka” and we should mention that Cheburashka is a character in children’s literature and children’s TV cartoons, from the 1966 story by Russian writer Eduard Uspensky. 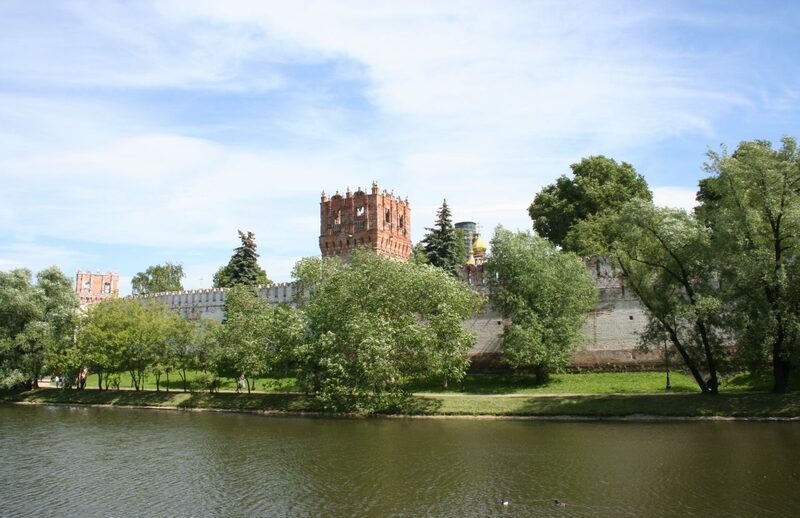 According to this fun story Cheburaskha lived in the tropical forest but accidentally fell asleep in a crate of oranges that was transported to Moscow. B. Pickled cucumbers and fresh eggs, mushrooms, cut into strips. C. Nuts should be broken with your hands, not quite small. D. Green onions cut into little. Combine all ingredients. E. Sour cream mixed with mustard, add salt and pepper and fill with salad. 4. Зеленый лук маленько нарезать. Соединить все ингредиенты. Here is a tasty recipe for Russian tomato salad. 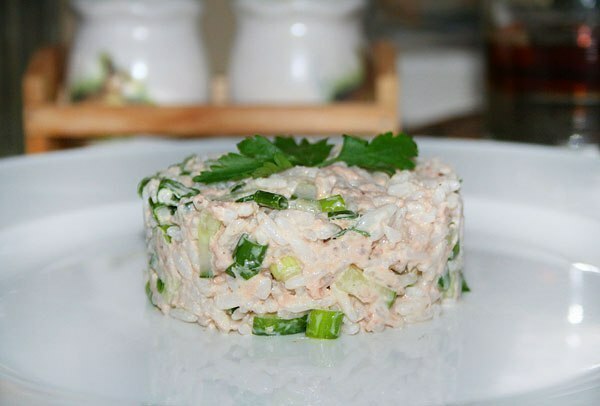 There are a variety of tasty seafood salads which can be found on a Russian table. We like this salad as it can be mixed and served in a bowl or poured into a form and then served to have that perfect presentation. Add mayonnaise, then add the cucumber and onion and mix together. Next, prepare the fish by removing any bones and mash the fish with a fork, then add to salad. Salad season with salt and pepper, add additional mayonnaise if needed and mix well. Refrigerate for an hour before serving. This is a delicious summertime chicken salad featuring simple but hearty ingredients like beans and cheese. – Pickles – 3-4 pieces. – Peal and grate the garlic. Cut slices of bread into cubes but not until they’ve been rubbed with garlic and salt. – Place the bread into an non-oiled pan to lightly brown. – Cut the chicken into small pieces. – Cut the cucumbers into cubes then drain the corn before putting into a mixing bowl. – Cut the cheese into strips or cubes. – Rinse and then finely chop the parsley. 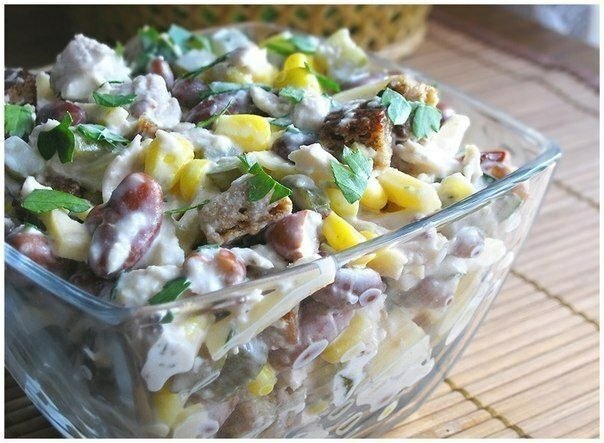 – In a salad bowl mix the chicken, beans, cheese, corn, pickled cucumbers, parsley and garlic bread. – Add mayonnaise and stir. Garnish with parsley. We love your cooking and recipes and would like to feature more of your work soon! We love your approach to food! We plan to feature you and your excellence in culinary skills again soon.